Question - We use a lot of tape for masking shaped components. I’m aware you can use pre-cut die cuts for masking shaped components, but what features are available to make die cuts faster and better than a knife and tape? Masking with tape and then trimming can be fast. Masking with pre-cut shapes, however, can be a lot faster and; more importantly, can be more consistent. There are a number of features that can be built into die cut masks which make them better than masking with tape and then trimming. A few of these are explored below. This is a style of die cut mask, also known as aircraft window mask style, where, instead of exposing all the adhesive on the die cut, only the outer perimeter of adhesive is exposed. This is particularly useful for larger die cut masks, where the masks are difficult to apply. Only exposing the adhesive around the edge of the mask means the die cut can be positioned quickly and accurately without having the problem of the adhesive sticking down in the center of the component making it difficult to align. It also means that this style of die cut mask can be removed quickly. The adhesive border is enough to hold the die cut in position through the finishing process, but it can be removed much faster than when all of the adhesive is exposed and stuck to the component. This style of die cut is also good for curved surfaces. The non-adhesive center portion allows the die cut to flex and crease if necessary, while the adhesive around the edge holds the mask in place. Die cuts with this feature can also be made with patches of exposed adhesive in the inner portion of the mask, to help with additional grip or to seal a feature. For components that need multiple areas masked, such as the inside of network cabinets or industrial enclosures, a masking kit of die cuts can dramatically improve production speed and quality. Each kit contains all the die cuts for a particular component. As the masker is masking the component, they know that once all of the die cuts are gone the component is masked completely. Kits can be supplied in sheet form with one kit per sheet; they can be supplied on a roll with lines separating each kit. They can even be supplied loose in bags with other masking products such as caps or plugs for that component. Masking kits can be marked with the part number of the component they apply to. Each mask in the kit can have a number marked on it to match with a work instruction for the masker. Kits with a large number of loose die cuts particularly benefit from numbering each piece. Not only does numbering each piece help with masking, it helps with inspection during the kit manufacturing process. In addition to numbering each mask in the kit, instructions or markings can be added onto the die cuts to help align masks. For kits with multiple masks on the same sheet, the masks can be laid out in a specific order, to help orientate the masks with the component. Transfer die cuts are extremely useful for masking components that have a number of unconnected elements, such as pads on a circuit board. They can also be used when masks need to be positioned relative to points on the component. Transfer die cuts consist of three layers, the liner, the die cut itself and a top transfer layer. Typically, the masking material around the die cuts has been removed and the transfer layer is clear to allow the masker to see through the top layer. To position the die cut, the liner is removed to expose the die cut adhesive, the die cut is then positioned and pressed into position on the component. The top layer can then be removed. Transfer die cuts can be aligned to elements that need masking or they can be set up to have registration areas on them, so the die cuts are aligned with a registration mark or feature on the component that is being masked. A tab is an additional adhesive or non-adhesive part of the die cut mask that is added to help handle the mask when applying or removing it. Tabs can help you remove the mask from the liner before you apply the mask to the component, by providing an area to hold that is not a part of the main mask. The adhesive on the mask can therefore remain untouched during the mask application process. This means the maximum adhesive bond between the mask and the component is achieved. Tabs can also help when removing the mask from the coated product. If you are having a problem seeing and removing masks after the coating is complete, a tab will help you find the mask and give you something to pull on to remove the mask. Tabs for removal are particularly useful when you want to pull a mask off quickly while the component is still warm. Die cut masks are manufactured on a liner, which is usually a complete piece, but it can be split into strips. The liner that is in strips is called slit back liner. Having the masks on a slit back liner means that instead of removing the complete mask from the liner, a section of the liner can be removed to expose the adhesive in one area of the mask. Exposing only a section of the adhesive allows you to align the mask with the component and then stick that section of the mask down. Once that section of the mask is applied to the component you can then remove the remainder of the liner. Slit back liner is also useful when the mask is an unusual or delicate shape. The liner can be peeled away from the mask instead of having to handle the mask to pull it off the liner. 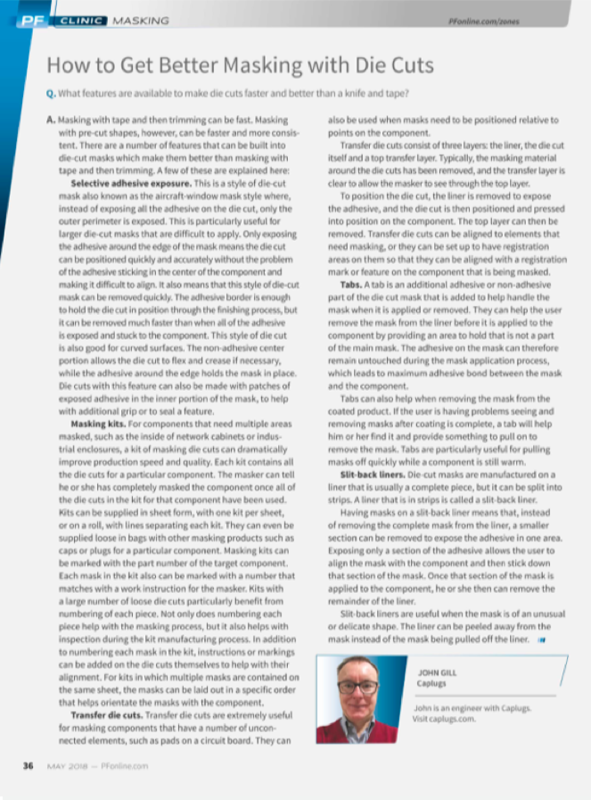 Written by John the article was published in Products Finishing Magazine. Return to the main press page for more help on masking for surface finishing.